The Islam Awareness Blog: Why Jew Hating Trump Supporters Love Israel. Their open fondness is built on two premises:“If Trump is pro-Israel, then he can’t be an anti-Semitic, white nationalist” is the logic that underpins this new right-wing orchestrated talking point, but anyone who follows the machinations of the Israel Lobby and its cadre of Zionist organizations and individuals knows only too well that far-right, white nationalist, and even avowed neo-Nazis have long been courted as allies in their fight to permanently erase Palestinians from the ever expanding Israeli controlled territory. 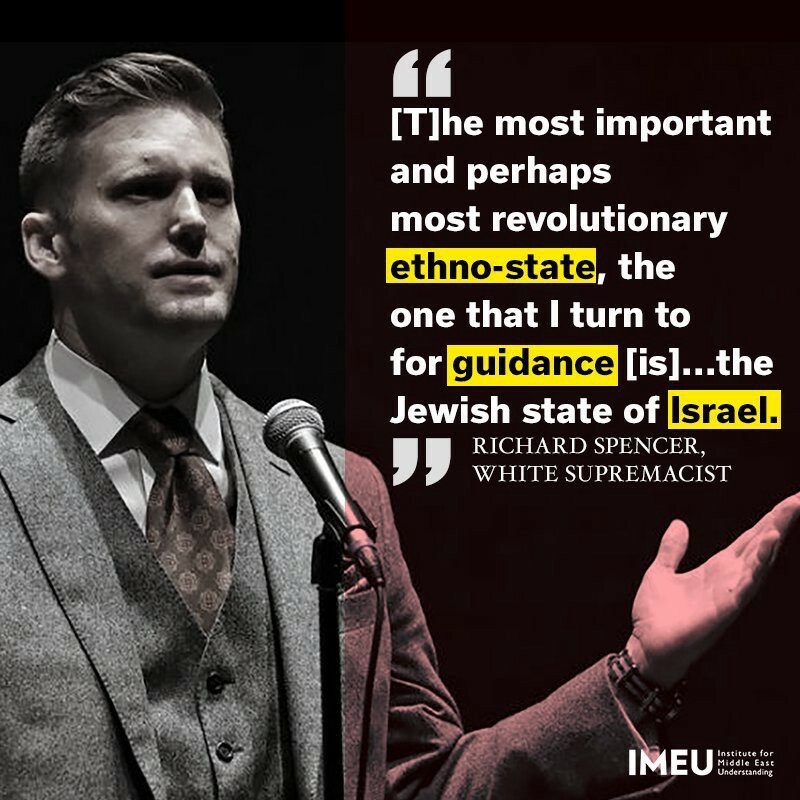 In fact, Israel not only weaponizes anti-Semitism to provide cover for its brutal security state apparatus, but also it was European anti-Semitism that created the Israeli state in the first place. When Theodor Herzi, the founding architect of the “Jewish state,” brought forward his idea for creating a state in Palestine for exiled European Jews in 1896, prominent Jewish intellectuals dismissed his idea, claiming it undermined Jews who had assimilated successfully in European societies. Dejected but not defeated, Herzi enlisted the help of the Chaim Weizmann, a prominent British Jewish figure, who, in turn, won support for Herzi’s proposed white European settler colonial project by recruiting the British Foreign Secretary Arthur Balfour, an avowed white supremacist. Balfour also enacted anti-immigration laws that were designed to restrict and prevent Jews migrating to Britain. In many ways, Balfour’s ban on Jews was the 100 year precedent to Trump’s ban on Muslims. Balfour thus became a hero among Zionist Jews, who were only to happy to ignore his demonstrable record of avowed white supremacy and anti-Semitism, which brings us to where we are with Trump and white supremacists today. In return, America’s Jew haters have praised Trump for his “honesty” and his defence of white America. What is telling, however, is the same anti-Semitic hate groups and individuals also support Trump’s decision to validate Israel’s war crime, recognizing Jerusalem as Israel’s capital. You see, while Nazis and white supremacists might still hate Jews, they simultaneously also love the apartheid Israeli state. 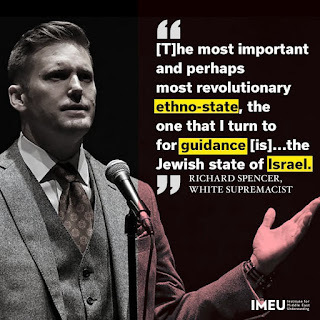 They love that Israel is everything they dream of: a fascist ethnocratic brute that suppresses a non-white indigenous population. Across Europe and the US, Israeli flags now wave comfortably alongside Nazi and white supremacist banners. When 60,000 ultranationalists marched on Poland’s capital last month, Israeli flags were there. When neo-Nazis marched on Charlottesville, Virginia, Israeli flags were neatly nestled among flags of the Confederacy. Paradoxically, however, anti-Semitism remains at the heart of the platforms of all white supremacy groups that turned up to either. The intersectionality between anti-Semitism and pro-Israel fervour is no accident. It was a strategy hatched and formulated by far-right, white nationalists in Britain in the late 90s before gaining traction in the aftermath of the 9/11 attacks. When Nick Griffin, a Holocaust denier, took the helm of the far right, ultranationalist British National Party (BNP) in 1999, he shelved his public anti-Semitism, replacing it with open hostility towards Muslim. Zionists of all stripes teamed up and leveraged the political mobilizing power of anti-Semitic far right groups. NYU adjunct professor Arun Kundnani noted that by 2008, “a group of well-funded Islamophobic activists had coalesced” in order to demonize Muslims and Islam for the purpose of gaining support for Israeli policies of occupation, segregation and discrimination from far-right voters, white supremacists, and anti-Semites. These pro-Israel individuals began positioning themselves as “counter-jihadists,” and, in turn, became darlings of the far right media landscape, with some even making their way into Trump’s foreign policy circle. Frank Gafney, for instance, who warned the US government had been taken over by the Muslim Brotherhood, continues to have Trump’s ear. So, no?—?Trump’s move on Jerusalem does nothing to assuage his prior expressed sympathies with anti-Semitic white supremacists. It only reminds us how deeply Zionism and white supremacy are woven into the DNA of two respective white settler colonial states: Israel and the United States.